Offered through The New York School of Burlesque! About Persona & Act Development • Register Now! What do drag queens and clowns (good ones at least) have in common? They are able to “pull off” their characters by creating and sustaining believable (or unbelievable) stage personae. The stage persona can be anything from an extension of self to a fantastic flaming creature and finding your inner “queen” is an effective way to connect with the audience and tell a story. Through improvisation exercises, writing prompts, and movement activities, this workshop will provide a framework, techniques, and the creative space to begin (or continue) the process of birthing and developing a flamboyant stage persona. Register at the New York School of Burlesque website. To obtain a spot on the waiting list or if you have questions, email Dr. Lucky: doctorofburlesque@yahoo.com. To learn about future classes, sign up for my mailing list. Dr. Lucky has given lectures and taught practicum workshops at New York University, CUNY, MICA, University of Philadelphia, Burlesque Hall of Fame (formerly Miss Exotic World), The New York School of Burlesque, Movement Research, City Paper (Washington, DC), BurlyCon, Toronto Burlesque Festival, Southwest Burlesque Showcase, Palace of Wonders, Performance Studies International, Popular Culture Association/American Culture Association, North East Popular Culture Association, and the Carnal Knowledge Conference, among others. In 2011, Dr. Lucky’s West Coast Teaching Tour brought her to Victoria, Seattle, Portland, and San Francisco. She is the curator of Camp Camp, a weekend intensive dedicated to helping performers hone their craft and explore their campy side! Dr. Lucky is a seasoned performer, producer and educator. Over the past 10 years, Lucky has carved a space for herself with her unique comedic timing and over-the-top theatricality. 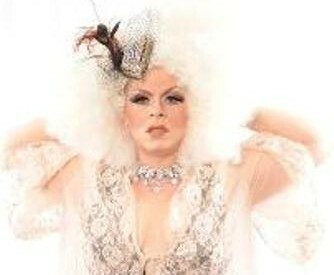 She has been hailed a “big, bad, bold drag queen” by Bust magazine and has been featured on NPR’s Morning Edition, NY1, Time.com, Washington Post, among others. Though a huge fan of hyperbole, the prefix to her name is the one “real” thing about her: she is the only burlesque performer in the world with a PhD. For the past five years, she has taught unsuspecting drama students at New York University how to twirl tassels and think critically about burlesque. She is also a faculty member at the New York School of Burlesque and has taught burlesque at BurlyCon, CUNY, Burlesque Hall of Fame, Movement Research, and the Palace of Wonders, among others.